Aylsham Round Table kindly donated the sum of £500 to Norfolk Army Cadet Force to be used for the purchase of new tents that will be used by cadets from across the County for Duke of Edinburgh Award Scheme expeditions and other adventure training activities. 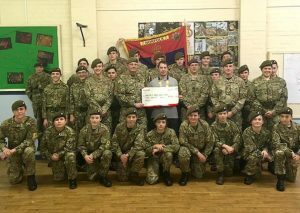 The cheque was presented to Aylsham Detachment which is one of 23 Cadet Detachments situated across Norfolk. The detachment at this time has over 30 cadets regularly attending as a result of the efforts by the Commander Colour Sergeant Tim Brown, his team of adult volunteers and the enthusiasm of the cadets themselves. Each year cadets are given the opportunity to take part in Gold/Silver and Bronze Camping expeditions in different locations around the Country. A key feature of these expeditions is that the participants aged 14 for Bronze, 15 for Silver and over 16 for Gold are supervised remotely and are not accompanied by adult staff. This gives them the opportunity to make their own decisions and work as a team to overcome difficult situations. They plan their own routes, prepare menus, carry their own equipment and food and cook their own meals; they are self-sufficient other than meeting trained assessors at suitably identified checkpoints who ensure they are meeting the conditions of the expedition. In the last three years 86 cadets’ have completed the different levels of the award. Of these successful cadets 2 from Aylsham successfully completed their Bronze, 6 completed their Silver and 4 achieved the high accolade of completing their Gold which involves an invite to St James Palace to be presented their certificates. In addition to the expeditions Army Cadets have the opportunity to complete a wide range of exciting activities ranging from adventurous training such as kayaking, mountain biking and abseiling to military-themed activities including shooting, fieldcraft and skill at arms, as well as training in first aid. Older cadets also complete leadership training and learn to teach others. These opportunities help them develop new skills, build confidence and most importantly, have fun.